Luke Combs recently achieved Platinum certification by the RIAA for his critically-acclaimed debut album “This One’s for You,” surpassing one billion career streams globally. “This One’s for You” is the fastest debut Country album to receive the Platinum crown since Chris Stapleton’s Traveller in 2015, reaching the newly-minted milestone in a break-neck 58 weeks since first releasing June 2, 2017. In the past year since his debut release, Combs has accomplished unparalleled success with three consecutive No. 1 singles at Country radio – 2x Platinum “Hurricane,” Platinum “When It Rains It Pours,” and Gold “One Number Away.” The favored son of Asheville, NC, reigned atop the Billboard Country Albums Chart for seven weeks and remains the most streamed Country album of 2018. The iHeart Radio Awards “Best New Country Artist” released This One’s for You Too, a 17 track expanded collection of his critically acclaimed debut album, on June 1 – with 5 brand new tracks that landed at No. 1 on Billboard Country Albums Chart, No. 4 on Billboard 200 Chart and immediately charted in the Top 10 on iTunes All-Genre Songs Chart. Named Billboard’s Top 100 Artist and Top New Country Artist of 2017, The CMA, CMT, ACM & Billboard Music Awards nominated singer songwriter made country radio history as the first new solo male artist to achieve a multi-week No. 1 since 2001. Brothers Osborne are the reigning CMA and ACM Duo of the Year. 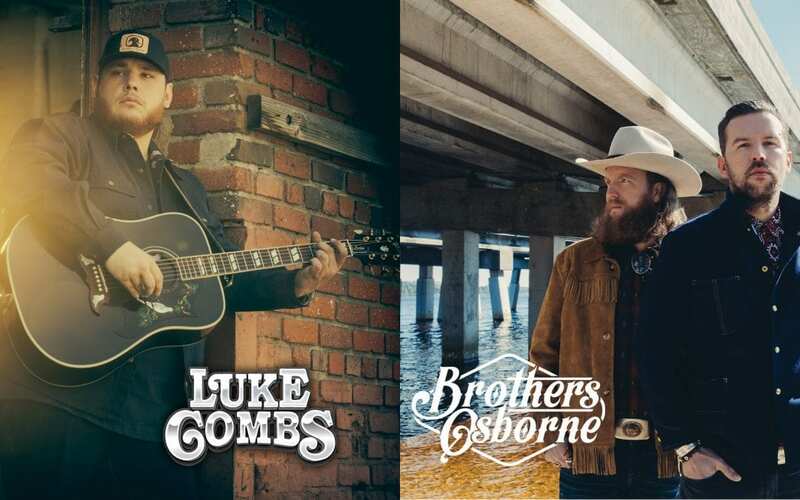 Before they climbed the country charts with songs like “Stay a Little Longer” and “Rum,” the Brothers Osborne grew up in Deale, Maryland, a small fishing town on the Atlantic seaboard. It was a cozy place, filled with blue-collar workers who made their living on the water. During the weekends, many of those workers would head over to the Osborne household, where a series of loose, all-night jam sessions filled the Maryland air with the sounds of Bob Seger, Hank Williams, Tom Petty and George Jones.